In the past few months, Japan has been experiencing political changes, notably with the December 2012 re-election of Abe Shinzo, a key figure of Japan’s ideological conservative right, as the country’s Prime Minister. This development threatens to have a drastic impact on Japan’s longstanding war-renouncing policies in the international area. During his first tenure as Prime Minister in 2006-2007, Abe ardently pushed for the revision of Article 9 of Japan’s Constitution in the name of building a “strong Japan”. Article 9 of the Japanese Constitution is the famous peace clause, which renounces war as a means of settling international disputes and prohibits the maintenance of armed forces and other war potential. Abe’s track record includes a series of decisions aimed at curtailing the scope of Japan’s peace clause, notably the creation of the Ministry of Defence, attempts to re-interpret Article 9 to expand the mandates of Self-Defence Forces’ missions and allow collective action, as well as, some will even say, encourage the debate over Japan’s acquiring of nuclear weapons. Back in power, Abe is determined to push his agenda forward. One of his first moves has been to order the bolstering of the country’s military and announce an increase of 40 billion yen ($440 million) in defense spending – the first increase in 11 years. He has also made clear that he intends to revise defense guidelines with the US, which would like to incorporate Japan’s SDF into the its global military strategy, and turn Japan’s Self-Defense Force (SDF) into a full-fledged national army. All these measures bring the debate over rewriting Japan’s pacifist constitution back at the top of the political agenda. Indeed, Prime Minister Abe has made no secret of his intention to push for constitutional revisions, notably of war-renouncing Article 9, as well as of many other peace and human rights dispositions. In fact, last April, before Abe returned to power, his conservative Liberal Democratic Party prepared a new draft constitution, with the changes it would like to see adopted as part of its broader agenda "to reclaim Japanese sovereignty" by getting rid of the current constitution, which, according to Abe, fails “to provide a necessary condition for an independent nation”. Changes proposed in the LDP’s draft include: deleting "the right to live in peace, free from want and fear" granted in the current preamble; removing Article 97, which guarantees fundamental human rights and the supremacy of the constitution; increasing the Emperor’s powers; limiting the freedom of speech "for the purpose of interfering public interest and public order"; loosening the prohibition to inflict torture and inhuman treatments; revising human rights provisions to place them in the context of “the State's history, culture and tradition"; curtailing the independence of the judiciary from political control; and imposing a number of obligations on the people, such as respecting the flag and national anthem, obeying commands from the State. The draft further insists that people have responsibilities and obligations towards the state in counterpart for enjoying freedoms and rights. But it isn’t a secret for anybody: one of Abe’s priorities is to amend Japan’s peace clause – Article 9. Japan adopted its war-renouncing constitution following World War II, with Article 9 as a promise to itself and a pledge to the world, particularly neighboring countries that suffered under Japanese invasions and colonial rule, to never repeat its mistakes. However, despite the restrictions of Article 9, Japan's SDF have gradually expanded over the years, making Japan’s military budget the world’s 6th largest and one of the biggest and most advanced militaries in Asia. They have also – in a long list of controversial and constitutionally questionable activities – provided support to US military operations in Afghanistan and Iraq, carried anti-piracy operations off the coast of Somalia, opened a military base in Djibouti, provided military aid abroad, in the form of disaster relief and engineering, notably in Cambodia and East Timor, and deployed troops to assist the UN Stabilization Mission in Haiti. In other words, Japan’s Article 9 is not just a provision of the Japanese law. It also acts as a regional and international peace mechanism towards reducing military spending, supporting conflict prevention, mitigating the negative environmental impact of the military, ending violence against women, and more. In July 2005, the UN-convened Global Partnership for the Prevention of Armed Conflict (GPPAC) submitted an action agenda for Northeast Asia that declared that "Article 9 of the Japanese Constitution has been the foundation for collective security for the entire Asia Pacific region." Today, in the current context of regional tensions, notably with China regarding sovereignty over East China Sea islets (Senkaku/Diaoyu/Daiaoyutai Islands), with South Korea (over Dokdo/Takeshima Island) and with North Korea over its nuclear program, the debate over amending Article 9 threatens to destabilize the fragile regional peace. Indeed, offensive remarks by Japanese right-wing politicians, particularly regarding South Korean ‘comfort women’ forced into sexual slavery by Japan’s Imperial Army during WWII as being “necessary” and questioning that Japan’s wartime actions should be considered as “aggression”, risk exacerbating already tense regional equations, while at the same time, territorial disputes have brought the issue of national security into the spotlight within the political debate in Japan. In a vicious circle, regional tensions and rising nationalism have tended to fuel each other, posing a great risk of disrupting the delicate balance in Northeast Asia, triggering an arms race and escalating into a regional – if not global – conflict. Recent surveys carried out by the Asahi Shimbun newspaper show that if 66% of Japanese voters support the Abe Cabinet, largely as a result of his Abenomics strategy to tackle recession, a majority of respondents oppose an amendment of Article 9 (52% are opposed to changing it, against 39% in favor), the creation of a national defense force (62% oppose it, against 31% who support it) and a re-interpretation of the Constitution regarding Japan’s right to collective self-defense – that the country possesses it but cannot exercise it – (56% in favor of maintaining the current stance against 33% that want the country to enable itself to exercise it). In this political context, and as Japan celebrates the 66th anniversary of the adoption of its pacifist Constitution that entered into force on May 3, 1947, many Japanese citizen’s groups are getting organized to initiate a public debate and raise awareness about the grave consequences Abe’s policies would have on Japan, the regional context and the image Japan has abroad. Launched in 2005 by a coalition of civil society organizations in Japan, the Global Article 9 Campaign seeks not only to locally protect Article 9 and build a society based on peace and security that do not rely on force; it also acts to educate people around the world about existing international peace mechanisms such as Japan’s Constitution and encourage governments to work towards disarmament, demilitarization and a culture of peace. At the international level, a strong international network of NGOs and individuals, including Nobel Peace Laureates and key international figures, has formed in support of the campaign. 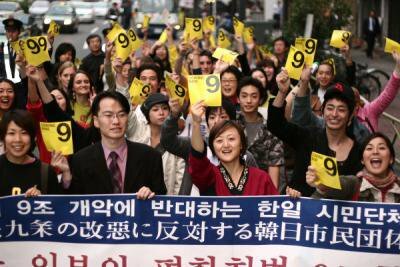 This growing international movement and support makes clear that the world values Article 9 as an ideal to which all people aspire, and as a model to follow. As part of the campaign, the large-scale Global Article 9 Conference took place in Japan in 2008 and two international follow-up events were held in 2009 in Costa Rica and Ecuador. Since then, the Campaign engages in advocacy efforts at the international level, highlighting the global impact of Article 9, notably in the fields of Conflict Prevention, Disarmament for Development, the reduction of military spending, the codification of the Human Right to Peace, as well as the promotion of Peace Constitutions. Today, Japan’s peace movement is seeking the urgent support of those who wish for peace, for Japan’s peace constitution and against the Japanese government’s trend of nationalism and its path to militarism that would have grave consequences for Japan, the regional context and international peace. Article 9 gives hope – hope that another world is possible. Should Japan renounce to its peace clause, the world would take a step back in realizing this vision.